Cruise over the spectacular Pontcysyllte Aqueduct, a Grade 1 listed building opened in 1805, and rising 38 metres above the River Dee. This magnificent 19 arch structure was engineered by Thomas Telford, and is 307 metres long. The view from the top is stunning, and not for the faint-hearted! On one side is a narrow footpath, on the other – a very small ledge. Also go over the Chirk Aqueduct, just prior to Chirk Tunnel. This aqueduct is smaller than Pontcysyllte, at just 21 metres high and 220 metres long, with just 10 arches. The Medieval Chirk Castle is along its own path, is about half an hour walk away canal and well worth a visit. The Castle is beautiful, and stands in its own extensive grounds. It was completed in 1310, and is still lived in today. In Llangollen visit the Llangollen Steam railway . If you want to spend a day or so at Ellesmere, there are some lovely castles & stately homes within a short drive, Powis Castle was built by the Welsh Princes in medieval times. Cruise past the Meres, or Lakes made in the Ice Age that surround Ellesmere to Whitchurch a lovely town, with lots of little side streets to explore, and plenty for the whole family to do. Leaving the marina, you will be on the Llangollen canal and heading towards Frankton Junction, where you need to keep to the right, on the main canal, where it now straightens out as you approach your mooring, near to Welsh Frankton. Frankton Junction is where the the Montgomery Canal jons the Llangollen Canal, 7 miles of this is navigable, up to Maesbury, and if you want to cruise along here you have to book with the Lock keeper the day before. (Ask at Blackwater reception before you leave). From this junction onwards towards Llangollen, the bridges start being numbered from No 1, so you can easily count your progress, and how successful you have been in navigating under the bridges without touching the sides!! Welsh Frankton is a tiny village, but it has a pub, called the Narrow Boat Inn, where they serve hot and cold food and real ale. The pub is right beside the canal, with lovely unspoilt views. What better way to relax on the first night of your trip? You have now cruised 4 miles in 2 hours. It is 2.5 hours cruise from Blackwater to Hindford . Today you will reach the spectacular Pontcysyllte Aqueduct, a Grade 1 listed building opened in 1805, and rising 38 metres above the River Dee. This magnificent 19 arch structure was engineered by Thomas Telford, and is 307 metres long. The view from the top is stunning, and not for the faint-hearted! On one side is a narrow footpath, on the other – a very small ledge. There are 2 locks quite close to each other. You will notice the landscape becoming more mountainous and the canal cuts through it, then, rounding a bend, you will be faced with Chirk Aqueduct, just prior to Chirk Tunnel. This aqueduct is smaller than Pontcysyllte, at just 21 metres high and 220 metres long, with just 10 arches. Thomas Telford was also the architect for this one and it was opened in 1801. The views from here are just as spectacular, and running alongside the aqueduct is the railway viaduct. Once over the aqueduct, you will immediately approach the tunnel, which has a towpath the entire length inside. Before you enter the tunnel, do make sure that there is no boat coming towards you as the it is only wide enough for one boat at a time. At the other end of the tunnel you will cruise through a long, wooded cutting, with the railway running alongside, and if you want to moor up here, you can walk to Chirk Castle along its own path, about half an hour away. The Castle is beautiful, and stands in its own extensive grounds. It was completed in 1310, and is still lived in today. Its is a magnificent medieval fortress of the Welsh Marches, he land was given to Roger Mortimer in recognition of his service in King Edward's wars against the Welsh and Scottish. He built Chirk Castle in the late 13th century. During the medieval period, Chirk oscillated between glory and disgrace. Five of its owners were executed for treason, their estates seized by the Crown - caught up in wars that rumbled on for centuries. It is 2.75 hours to here so spend the rest of the day exploring the Castle. Moving on from here, your next point of interest is Whitehouses Tunnel, which is only 191 yards long, and after this the canal meets the valley of the River Dee. The scenery here is spectacular, with views across the valley. You will soon reach Froncysyllte, a small village nestled on the hillside, on the banks of the River Dee. From here, you can see the Cefn Railway Viaduct over the river. There is a lovely old coaching inn here, just above bridge 28, with wonderful views over the aqueduct. You wont miss it because it is painted bright yellow! This is a beautiful spot for a nice meal and relaxing drink. You will now head for the magnificent Pontcysyllte Aqueduct, via a deep valley on a massive embankment. Once you are on the aqueduct, remember to take lots of photos of the fabulous scenery all around you. 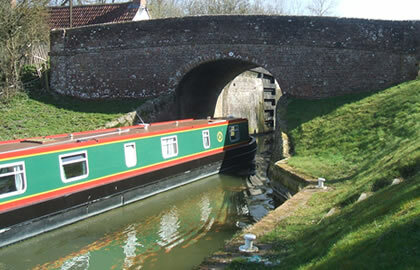 (Before entering the aqueduct, make sure no-one is coming towards you as it is only wide enough for one boat. You may have to wait your turn if there are other boats waiting to cross). At the north end of the aqueduct you will need to make a difficult left turn to go towards Llangollen, but you might like to stop first and take a look around Trevor, a pretty little village to the right of the canal. There is a nice pub here called The Sun, so if you want to have a drink or something to eat before you continue, now would be a good time. Leaving here, you will notice that the canal narrows considerably as you approach the Vale of Llangollen, so do take care. As you continue your journey, the canal clings to the hillside over the Dee Valley, with fantastic views all around. You can relax and enjoy the peace and quiet, birdsong and the gentle chugging of the boat as you slowly make your way to Llangollen. This narrow stretch of canal is on the side of tree covered mountains and is an area of outstanding beauty. You will be cruising high above the town, until you reach Siambr Bridge No. 45, where you will need to turn. However, before you turn, moor up at the bridge and make the most of your time in Llangollen. (see Navigational Notes above). A short walk will take you to the Horseshoe Falls, where you can take a trip on a horse drawn boat along the canal. The Horseshoe Falls were designed by Thomas Telford and were completed in 1808. It is well worth visiting even if you don't go on the boat, as the walks are just as lovely. If trains are more your thing, you might like to visit the Llangollen Steam Railway. You will find the railway beside Dee Bridge in Llangollen. You will have to pay to moor in the basin, buts its only about £7/8 for 24 hours , and there is so much to see its worth mooring up to look around this pretty town. When you leave here, head back towards Pontcysyllte Aqueduct, and past Chirk and over through the Tunnel and over the aqueduct . You can moor up by Moreton Bridge 17 where the lovely Lion Quays Pub awaits. It is just over 4 hours to here. Keep cruising back to Ellesmere where you can spend some time exploring as its a nice place to moor, with a supermarket at the end of the Ellesmere Arm. Ellesmere is a busy 18th century market town with delightful pubs and restaurants, also a variety of shops and a Co-op. Powis castle is only 25 miles away by car (30 minutes), this is the home to the Earls of Powis, and was built by the Welsh Princes in medieval times. The Ellesmere Sculpture Trail is made up of sculptures set in the unique and beautiful landscape of Ellesmere in North Shropshire. The pieces are created by international contemporary artists, commissioned by the Ellesmere Sculpture Initiative (ESi), and are made specifically in response to the location. Pass through the Meres that make this area famously called the mini Lake District. The largest Mere is by Ellesmere itself, you can walk to it from Bridge 57 just after the short Ellesmere Tunnel. Blake Mere is passed on your left, then Cole Mere further on your right. The Meres were carved out during the Ice Age. Your destination is Whixall Moss Junction, passing close to several of the meres that give Ellesmere its name, such as Blake Mere and Cole Mere. You will also see open countryside and a hilly wooded landscape. Continuing on the canal, you will reach Bettisfield, a very small village of around 150 homes. It is on the England/Wales border and right beside the canal. 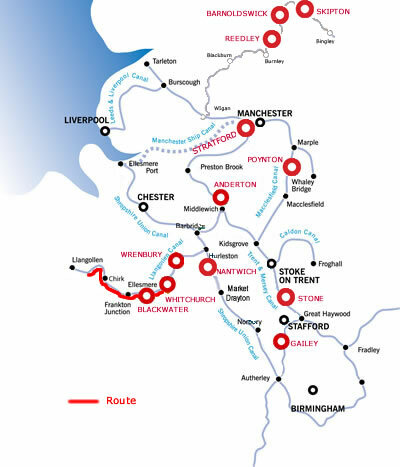 Moving on from here, you will cruise through a nature reserve, then shortly you will be at Whixall Moss Junction, where you can moor for the night. The canal branches away to your right but Prees Branch only leads to a nature reserve & a marina, so keep left. It is a relatively short distance from here to Whitchurch, where you will need to moor at the Whitchurch Arm . Houses and shops from all periods can be found in Whitchurch. It is a lovely town, with lots of little side streets to explore, and plenty for the whole family to do. It is 5.5 hours to here from Ellesmere. When you are ready, you should turn your boat in preparation for the return journey, then start to make your way back towards Blackwater Marina. The boat has to be returned by 9.30am tomorrow, just 5.5 hours cruising. All the above places of interest and places to moor are suggestions only. You are free to moor wherever you choose and plan your own itinerary.